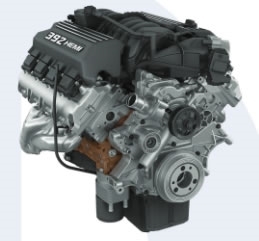 Step up to the next level of performance with the SRT® 6.4L HEMI® engine. 485 horsepower and 475 lb-ft of torque. New engine assembly, not a reman. Int: 15.0 mm (0.591") – 288 deg. Exh: 14.0 mm (0.551") – 292 deg.